Our Carrick on Shannon Go Karting Stag includes accommodation, Go Karting, main course and a pint, Pub crawl pass to Top Carrick on Shannon Bars and VIP admission to a top Carrick on Shannon nightclub including complimentary drinks. BEAT THE STIG – Beat the Stig is a 30 minute race where each driver races around our track and every lap is timed and the person with the fastest lap at the end of the session is the winner. 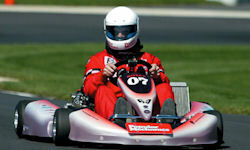 If anybody beats our Stig’s lap time they will receive a year’s free go karting. ACCOMMODATION Our Carrick on Shannon Go Karting Stag includes accommodation right in the centre of Carrick on Shannon. (Carrick on Shannon accommodation can be booked online – book accommodation only). FRIDAY NIGHT – a reserved area in a top Carrick on Shannon Bar – Reserved area & platter of finger food. SATURDAY NIGHT – enjoy a scrumptious main course & pint in a top restaurant. SATURDAY NIGHT – your group will be on the guest list to a top Carrick on Shannon Nightclub – VIP Entry, Reserved Area & Complimentary Shots on arrival.